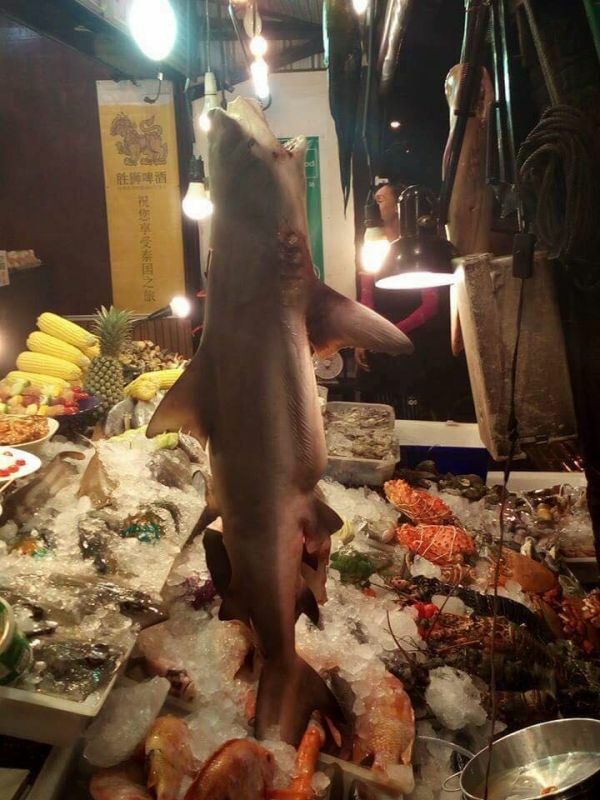 PHUKET: The Phuket Department of Marine and Coastal Resources (DMCR) yesterday (Nov 19) inspected a number of seafood restaurants in Karon after Zebra shark and Bull sharks were alleged to have been found being sold on a menu at restaurant in the popular tourist town. The issue came to light when Facebook user ‘Sunshine Sketcher’ posted two pictures along with the message: “The first picture, Death at Karon, Zebra shark was sliced and shown, taken by a foreign tourist on Nov 10,” on his Facebook page last Thursday (Nov 16). In response to Sunshine Sketcher’s post, on Saturday (Nov 18), Dr Thon Thamrongnawasawat, Deputy Dean of the Faculty of Fisheries at Kasetsart University in Bangkok and official advisor to the Department of Marine and Coastal Resources (DMCR), on Saturday (Nov 18) made a post on his Facebook page. Dr Thon’s post read; “The problem of rare sharks such as Hammerhead sharks, Zebra sharks and Bull sharks being served as food is a never-ending issue. The only hope is now on the DMCR to push some kind of sharks to be protected animals. While some animals are half-way to being classed as reserved animals or protected animals, to push something like this takes time, but marine lovers will not easily give up, will you?” Dr Thon explained. 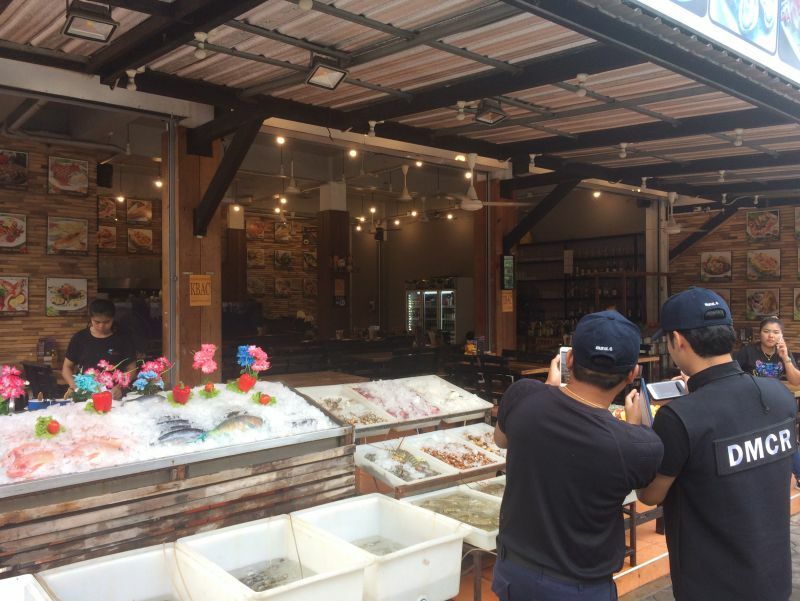 At 4pm yesterday (Nov 16), fisheries specialist Nares Chuphueng together with other officials from the DMCR Phuket office went to Champ Kata Seafood restaurant close to the Ibis Phuket Kata hotel where the photos were said to have been taken. Officials met restaurant owner Narongchai Thanathaweesakul and the restaurants manager Theerasak Jampathong. However, at the time of their meeting no Zebra or Bull sharks were found for sale. Mr Nares told Mr Narongchai and Mr Theerasak that by selling the said sharks they were contravening the Ministry of Natural Resources and Environment’s (NRE) National Environment Quality Act. Mr Narongchai admitted that the picture of the Zebra shark was taken at his restaurant. However, he said that the picture of a Bull shark was not taken at his restaurant, and that it was an old picture from last year. “We got the Zebra shark from the Phuket Fish Market in Rassada. We did not know it was illegal. We apologise to Thai people for this. From now on we know that many fish cannot be sold. We will help to publicise this fact,” Mr Narongchai said. In addition, Mr Narongchai and Mr Theerasak of Champ Kata Seafood restaurant both signed an agreement whereby they would no longer sell marine animals protected by the law. And with the change in demographic from Western tourists to Chinese, expect to see much more of this. 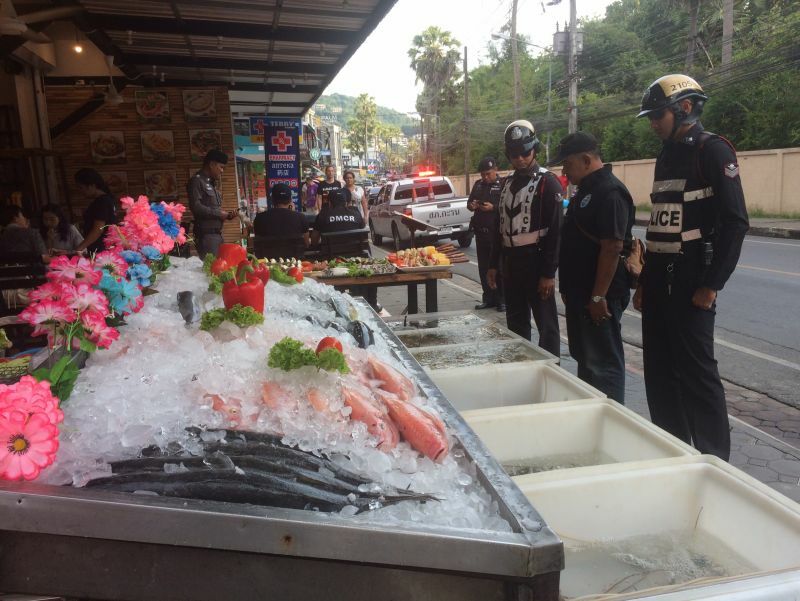 So 10 local cops transferred out because of some raid to do with a 'seafood restaurant' owned by Bangkok cops and suddenly this article....coincidence? 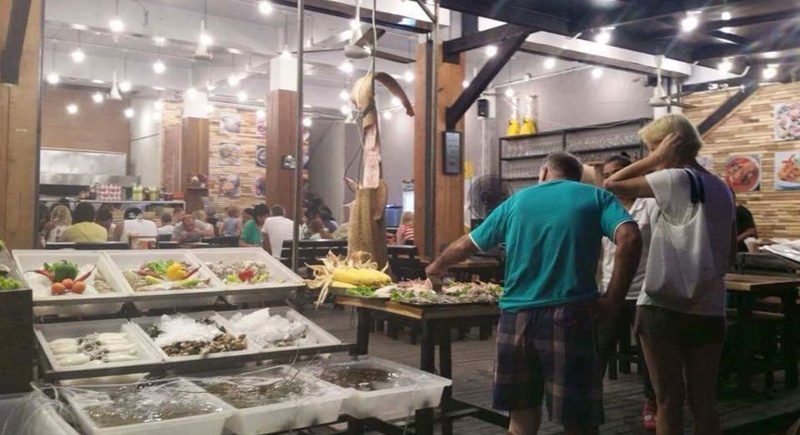 It seems that DMCR officers better check Phuket restaurants on selling protected animals for dinner in order to protect the marine environment rather than walking at beaches to explain the smoking ban to tourists, which actually become effective after Phuket high season.